This is the least expensive and most common material. Bars are generally cold drawn which increases bar strength and hardness, but leaves a dull, imperfect surface finish. Bars are not always perfectly round and may have sanding or file marks to make them fit in a bearing. Keystone may substitute a higher grade material without notice. Bars are generally available in either 12 foot or 20 foot lengths. These bars have a higher carbon content which makes them stronger than 1018 Steel. Because they are turned, ground, and polished, the bars have a better surface finish (32 RMS), a tighter diameter, and better roundness compared with the cold drawn bars. Smaller diameters are generally cold drawn and then ground and polished. Larger diameters are hot rolled, then turned, ground, and polished. Bars 1-1/4" and under are straightened after keying. Larger diameters generally do not bow much, but straightness cannot be guaranteed without an additional charge. Bars are generally stocked in 24 foot lengths, (12 foot for keyed bars). Some diameters are stocked in 20 foot lengths. This material is stronger than 1045 steel because of the high carbon content and a heavy draft cold drawing process. The addition of sulfur makes these bars more easily machined, and stress relieving makes them generally straighter after the keyway is cut. Stressproof® is a trademark of Niagara LaSalle Steel and only bars made by them can be considered Stressproof®. Bars may be A311 Class B, an alternative specification governed by ASTM. Keystone stocks some diameters in a turned, ground, and polished finish. Keystone only carries a limited inventory of this material. Bars are generally stocked in 20 foot lengths. 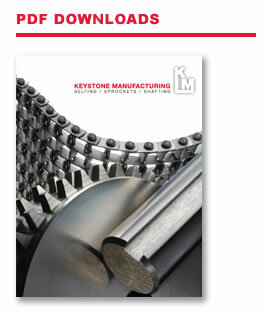 This is the strongest material offered by Keystone Manufacturing, Inc. It is heated then quenched and tempered to a hardness of 26-34 Rc. then ground and polished to size. Keystone will sometimes substitute 4142 or other alloy as long as the mechanical characteristics meet those of 4140. Keystone only carries a limited inventory of this material. Bars are generally stocked in 24 foot lengths (12 foot for keyed bars). This is the most popular grade of stainless. It offers good corrosion resistance and is suitable for all food applications. All bars are ground and polished for tight diameter tolerances and roundness. Smaller diameters are cold drawn then ground and polished. Larger diameters are hot rolled then turned, ground, and polished. See below for a comparison of the corrosion resistance of various stainless steels. Bars are generally stocked in 12 foot lengths. Some diameters in 24 foot lengths. This is very similar to T-303 SS but offers slightly higher corrosion resistance. It is also harder to machine and to cut. Keystone only carries the most popular diameters of this material. See below for a comparison of the corrosion resistance of various stainless steels. A much higher nickel content makes this grade much more corrosion resistant and expensive compared with other grades. All bars are ground and polished for tight diameter tolerance and roundness. Keystone only carries the most popular diameters of this material. See below for a comparison of the corrosion resistance of various stainless steels. This grade offers high strength and hardness along with decent corrosion resistance, only slightly lower than that of T-303 SS. All bars are ground and polished for tight diameter tolerance and roundness. Keystone only carries the most popular diameters of this material. See below for a comparison of the corrosion resistance of various stainless steels. 0.07 max 1.0 max .04 max .03 max 1.0 max 15-17.5 3.0-5. .15-.45 3.-5.